Unless you don't like lemon, I recommend using the lemon zest for freshness and a light lemony flavor. Place the strawberries in a food processor, and process until pureed. Strain the mixture through a fine mesh strainer to remove the seeds. This is your strawberry puree. You'll need 1/4 cup of puree for this recipe. If you have extra, save it for another purpose. Place chopped chocolate and cream in a medium heat-proof bowl. Carefully microwave in 20-30 second intervals, stirring in between each interval to prevent overheating, until melted. Alternatively, set the bowl over a saucepan of simmering water, stirring occasionally, until melted. Add ¼ cup strawberry puree and lemon zest and mix until combined. Add food coloring, if using, a tiny drop at a time. Cover the bowl and chill in the refrigerator for 4 hours or until firm. Place powdered sugar in a small bowl. Take chocolate mixture out of the fridge. 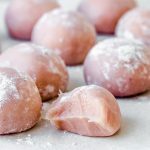 Using an ice cream scoop, spoon, or melon baller, scoop out small sections and form them into balls with your hands. Roll each ball in powdered sugar and place on a baking sheet lined with parchment paper. Refrigerate until firm. Truffles can be frozen for up to 2 months. To thaw, leave them in the fridge overnight.